Vintage Clothing Blog | Vintage Wedding Dresses | Salvage Life: Sunglasses: Target, Saks or Vintage? Sunglasses: Target, Saks or Vintage? I bought these sunglasses at Target the other day and I just love the shape and style, not to mention the $12 price tag. Unfortunately, they will probably go the way of so many other pairs I've owned over the years. They will get scratched, broken or lost and eventually end up in the trash or Ruby's ever expanding dress up pile. I've been debating for a long time whether I should invest in a nice pair and try to keep them in good condition. Do you think the sheer cost would be enough of a motivation to keep them in good condition? I'm sure I've spent hundreds of dollars on cheap pairs over the years, but could I keep one pair for years? What if they go out of style? And what about vintage? I've bought and worn vintage sunglasses, but I'm not sure about the eye protection and my eyes are very important to me. Of course, Target might not be that much better. I'd love to hear your thoughts! I tried that once and bought $60 sunglasses which were expensive to me. I was hoping it would help me take better care of them, but it didn't. I lost them after 3 months. So I only buy cheap glasses now. I just discovered a huge basket of glasses at our good-will. I might buy glasses there from now on! i used to wonder about this too. i always wore cheap, new and vintage, sunglasses. i couldn't understand buying a designer pair only for them to get scratched or to break. then, i started wearing a pair of my boyfriend's expensive sunglasses that were too small for him. but, they weren't just expensive, they were well-made (a lot of designer glasses are expensive, but they're not made very well...). i couldn't believe the difference they made. they fit well and protected my eyes while being quite stylish. i've been wearing them for two years now while the dozen other pairs i own sit in a drawer. i should admit to being very upset after i thought i had lost them, but then again, i would be upset to lose anything i wore almost everyday that i had grown to like so much, regardless of how much money they cost. 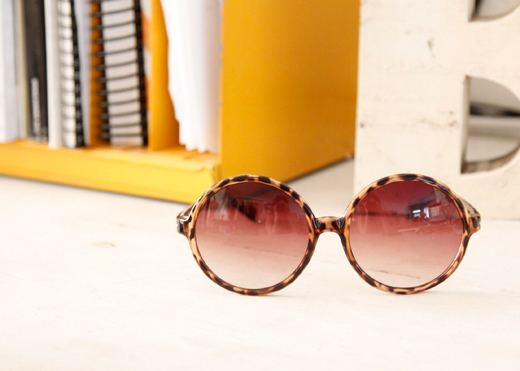 investing in a quality pair of sunglasses isn't a bad idea. you can find quality classic styles that will outlive trends and won't break as easily as cheap pairs. I admire your blog for being a rich source on wedding ideas. Love to visit often your blog.